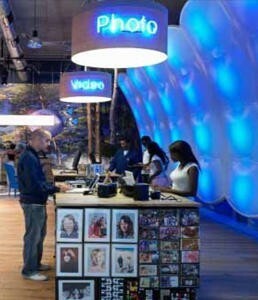 JPDA, the New York-based architecture studio, has designed the new O2 Concept Store in London. The Store was conceived as a physical embodiment of the O2 brand sensibility and a showcase for the company’s core services. The space is organized around the practical integration of O2 into the daily activities of the visitor, emphasizing the accessibility and creative lifestyle. Designers always considered the O2 brand to be soft and tactile and the inflatable colour changing pillows reflect the bubble logo of the mobile phone company. Designed as a tactile and friendly space, fabric seemed the obvious choice to create an environment which reflected this and also contrasted nicely with the conventional modern view of technology represented in chrome, glass and angular shapes. Large, inflated PVC coated polyester pillows were installed over two entire walls and formed the basis of the installation. The lighting department then stepped in and lit the pillows with LED colour changers mounted on the frame behind. Proximity sensors located behind each column interact with customers and change the effect of the lighting as people draw near or step away. The funky colour changing pillows help realise the designers’ desire to create a laboratory space which encourages people to interact with the phones and their environment.